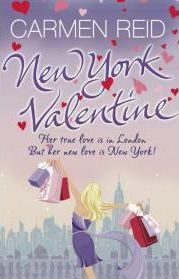 When I first started reading ‘New York Valentine’ by Carmen Reid, I was not altogether convinced that I was going to enjoy it. It seemed a bit frivolous and silly and all of the main characters appeared to be shallow and obsessed with fashion labels. However, never liking to give up on any book, I persevered and read on to the end. I am very glad that I did as I actually ended up really enjoying this book. The main character is an almost middle aged woman called Annie Valentine. I soon realised that Carmen Reid has actually written a number of books about Annie, such as ‘How Not to Shop’ and ‘The Personal Shopper’, which I had not read.